This water is so clear, it's almost invisible! If you spend even a few minutes Googling "gorgeous beaches" or "beautiful water"—and let's face it, if you didn't take to the Internet to cool your wanderlust, you wouldn't be here—you'll realize there's plenty of competition, all around the world. Do you head to Southeast Asian pearls like Phuket or Myanmar's Mergui Archipelago, or to the beautiful (but sinking) Maldives? Do you snorkel the reefs of Belize and the Bahamas, or skip the Caribbean for the Red Sea beaches of Egypt or even Sudan? One option many people forget in general is the Mediterranean and, specifically, Greece. Even travelers who come to Greece often head straight to the Cyclades, the island group that includes iconic Mykonos and Santorini. Two words explain why you shouldn't do that: Melissani Lake. Greece's Melissani Lake, which may just be home to the clearest waters in the world, happens to sit inside a cave, a complicated arrangement, although not one that's unique to Greece. Geologically, Melissani Lake and Cave are quite similar to the cenotes you find in Mexico's Yucatán peninsula. Effectively, Melissani Lake is an aquifer: The water inside the lake is seawater that has been sucked into the cave, which filters it and makes it even more beautiful and transparent—and Greece's seas, if you haven't noticed, are already quite splendid, clear and blue. It's not quite fresh by the time it enters the cave and is technically still brackish, however, so consider this before taking a drink! The water that exits the cave heads back to the sea, coming out at Fridi Beach. Physically, Melissani Lake's surface is about 60 feet below the surface of the ground outside it, and features prominent stalactites, which are relatively ordinary in appearance when you compare them to the lake's extraordinarily clear water. Geologists estimate the cave to be around 20,000 years old, which is relatively young as geological things go. You might read online that Melissani Lake was "discovered" in 1951, but that's only as far as modern people are concerned. To be sure, the lake is mentioned in Greek mythology and, in fact, had an important place in it: It's known as the cave of the Nymphs, female spirits who embodied a sacred space somewhere between man and God, a space you might feel trapped in when you visit Melissani Lake—read on to learn how to do that. Melissani Lake is located on the island of Kefalonia, which is in Greece's Ionian Islands group, located just to the west of the Greek mainland about an hour's flight from Athens. Alternatively, you can reach Kefalonia by ferry from Piraeus, Athens' port, and several other ports of call, both on the Greek mainland and within the Ionian Islands. How you get here will largely depend on how much time you've devoted to your trip to Greece. Melissani Lake is officially "open" to tourists from May through October and during daylight hours on days that fall during those months. You can take a taxi (or drive your own car or motorbike) to Sami, the nearest town to where the cave is located, then access the inside of the cave independently, thanks to stairs that have been built. Keep in mind that you will need to hire a boat and boat captain if you want to see down into its clear water from above. 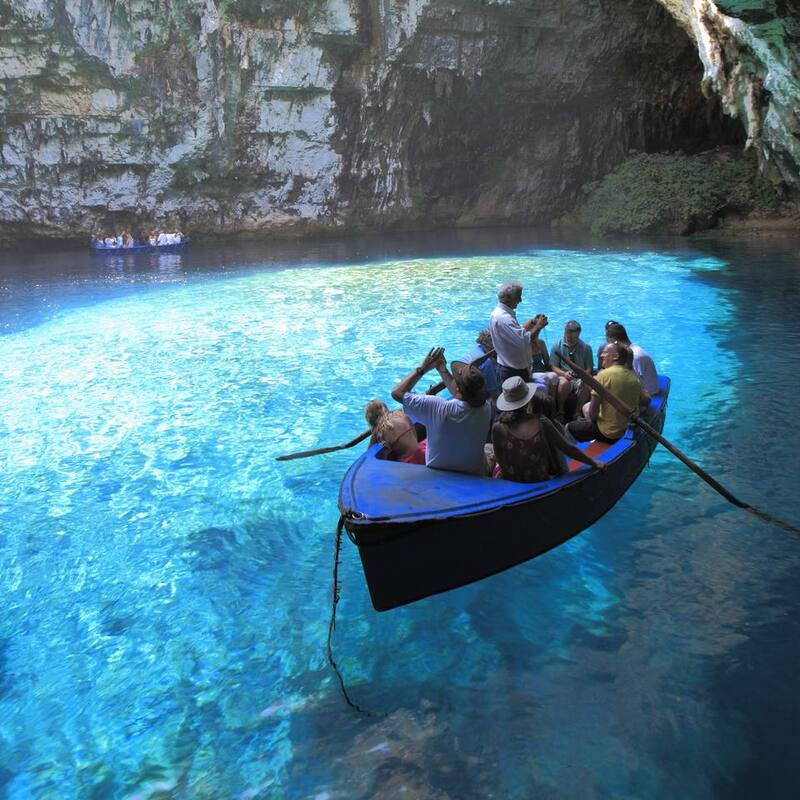 Another way to visit the clearest lake in the world is by taking an organized tour to Melissani Lake with one of the dozens of tour companies that operate on Kefalonia. The easiest way to organize a tour to Melissani Lake would be to do so through your hotel, although you can also check to find dozens of tour companies on a stroll through Kefalonia village. Beware, though: These operators often prey on the desperation you might feel as a last-minute traveler, so if the rate they charge sounds too high, it probably is. Tour prices, as with most things in Greece, can be bargained, so if you feel like you're getting ripped off, try to haggle down to a price that's more favorable to you. Whatever you do, don't let touts see through you as if you're as clear as the waters of Melissani Lake!